There is no way around it: the Dakota Access Pipeline (DAPL), an 1,172-mile underground oil pipeline set to stretch its way from North Dakota to Southern Illinois, is a contentious matter—but one Long Beach watering hole is taking a stance against the controversial project in the hopes of raising money to help activists get to and from its central protest site, Standing Rock. its industrial achievements but its impact on Native American lives and the environment. A number of Native Americans in Iowa and the Dakotas have opposed the pipeline, including the Meskwaki and several Sioux tribal nations, organizing to create ReZpect Our Water, the group currently protesting the pipeline’s creation at the Standing Rock Indian Reservation. For local activist Patrick Conlon, following President Donald Trump’s executive order to move forward with the project and the call for heightened activism, now is the time to show that Long Beach doesn’t stand for bad environmentalism. And not just gas money: Conlon hopes people will bring warm clothing, firewood, and supplies in-kind for those who have made the trip to Standing Rock—like Long Beacher Tahesha Knapp Christensen, who herself has been to Standing Rock in the name of one moto: water is life. For Christensen and the thousands who have took to Standing Rock, the encampment becomes intimate quickly: values about the earth being shared along with human dignity prove to be strong glue for human connection. “There is no race, gender, or religious ‘isms’— it is just people living, loving, and protecting alongside each other in the context of wanting what is best for our Mother Earth and for the future of our humanity in the fight against corporate greed that cares nothing for humanity or our clean water,” Christensen said. 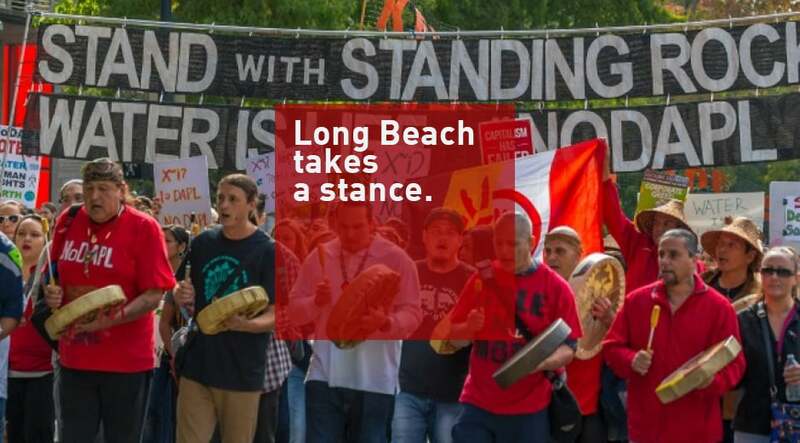 “I want to find a way to bring this love and respect among the diversity of people in Long Beach in a similar manner organizing people in a grass roots way along traditional Native values in an Indigenous-led movement. I am honored to bring the sacred fire of Oceti Oyate home and share it with my community as we fight against our own pipelines and for sovereignty here at home. Taking place at Muldoon’s in North Long Beach, the fundraiser is set to not just raise awareness over DAPL but environmental issues as a whole. No DAPL: A Fundraiser for Standing Rock, will take place on Saturday, February 11, from 5PM to 2AM at Muldoon’s Saloon, located at 5646 Paramount Blvd. For more info, click here.